These hilarious book memes celebrate the joys and heartbreaks of immersing yourself in a good book. If you've ever found yourself staying up all night to get to the final page, or missed your subway stop because you're lost in the world of fiction, then these book memes are for you. There's nothing like cracking open a new book, knowing you're about to immerse yourself in a new world for a little while. Don't you hate it when you have to "adult" when all you want to do is stay home and read? Bookstores are pretty much the greatest places ever, with the possible exception of libraries. "And now for our next scary story: Fahrenheit 451!" It's amazing how we can fit in all those characters and plots while still grasping reality. For the most part, anyway. Admit it, you've been tempted to start that glossy new novel before completely finishing the classic tome that's taking up residency on your nightstand. Everybody else gets emotionally invested in fictional characters' lives, right? It's not just me? If by "collection," you mean that huge stack of books that I haven't gotten around to reading yet, then yes. I have a massive "collection." It's all about the quality of your reading time—not the quantity of books on your shelf. Also, terrible eyesight from reading in the dark when it's way past your bedtime. It might look like a mess, but every single one of those books sparks joy. The only cure for a book hangover is a trip to the library or book store to get more books. 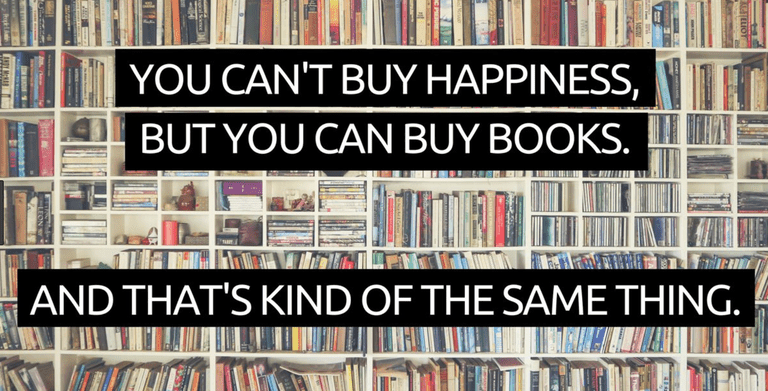 For lifelong readers, books are our one true love. What is it about reading quietly that gives every person in the vicinity a sudden desire to chat? Walk it off, walk it off! Oh author, how could you do this to me? Honestly, sounds like a great Saturday night. Just when you start to doze off, the plot picks up, and you can't possibly put it down. This is the romantic storyline readers are looking for. Some books stay with you for a lifetime, that's for sure. He is the "Most Interesting Man in the World," after all. You think he could get that title if he didn't read? Or you'll get this grimace in response. Why Do I Open My Heart in This Way? Good writing has a way of sucking us in, whether we like it or not. The sign of a truly good novel is that you're still thinking about the characters long after you've finished reading.